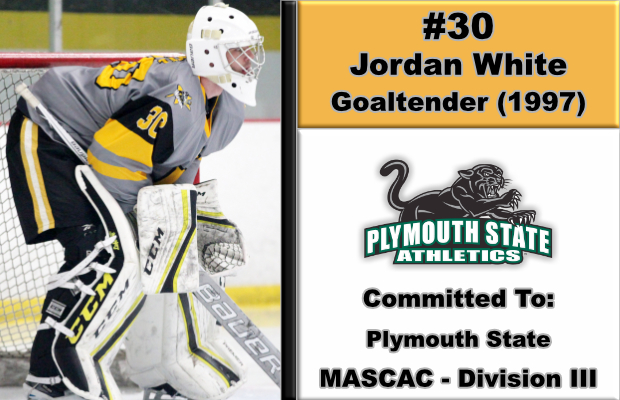 BEDFORD, MA -- The East Coast Wizards are pleased to announce that Jordan White has committed to Plymouth State University for the Fall of 2018. The '97 just finished his first full season with the Wizards, owning a record of 3-3-2 for the year. "Jordan is a big netminder who takes up a lot of room between the pipes," said Wizards head coach and general manager Freddy Meyer. "The knock on goaltenders of his size is often their speed from post to post, but Jordan strays from the norm in this department. Kory [Falite] and I have been impressed with Jordan ever since he arrived at the end of the 2016-17 season. If he hadn't missed the time he did due to injury, his numbers would be at the top of the charts in the EHL." As Meyer mentioned, White was sidelined for a large portion of the season due to injury, but that didn't keep him from realizing his dreams. While it's difficult for any player to just sit and watch, White did what he could to continue to develop while he was in the stands. The native of North Carolina is very appreciative of the time he spent with the Wizards, and knows it was critical towards his NCAA Commitment. "Playing for the Wizards helped me mature both on and off the ice," said White. "Freddy and Kory made it easy to play for them as they instill confidence and determination in their players. Adrien pushed the team in the weight room to help us get stronger on the ice. However, most importantly I’d like to thank my parents for supporting me through all the years of hockey and helping me reach my goal of becoming a college hockey player. I am very excited to be a student-athlete at Plymouth State this Fall."